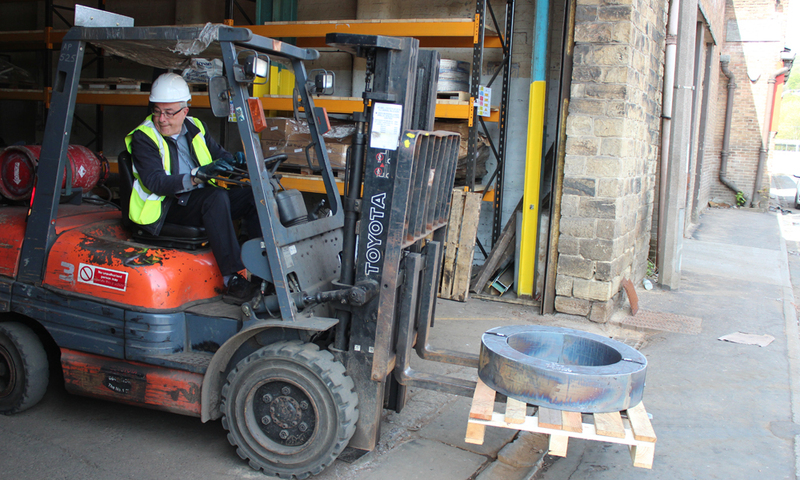 Working for Pulman Steel offers the potential to progress within a long established company. We are a knowledgeable team that takes immense pride in what we do. If you feel you have skills that will benefit our team please download the application forms and send them along with your CV and covering letter to the HR Manager, Abram Pulman & Sons Ltd, Walton Street, Sowerby Bridge, West Yorkshire, HX6 1AN. Profile Labourer | Full Time | £16,649.88 per annum plus £1040.00 per annum late shift allowance. The job entails learning to fettle work pieces using hand held grinders, collation of completed and part work orders, despatching, loading, banding, palletising and shrink wrapping in a safe and timely manner to fulfil our customers’ requirements. Some of this work will be carried out with the aid of, overhead cranes and pallet trucks. Within that process you will be expected to become competent, after training, in the following. Pick orders from our racking system/fettling/despatch areas using overhead crane, or by manual handling. Use our fork truck/crane to load and unload the racking system and vehicles. Unload and check incoming buy out materials. Fettling Profiled materials using a hand held grinder. Assembling and picking and packaging of completed works orders. Undertake the daily checks on the fork truck and other Profile associated equipment. Ensure you work safely adhering to the companies H & S requirements. Keep your work areas clean and tidy, assisting with profiling machine bed cleaning. PPE will be supplied including ear defenders and you will be expected to wear it at all times when on the shop floor. Friday – 12.50 p.m. till 8.00 p.m.
£16,649.88 per annum plus £1040.00 per annum late shift allowance. Holidays: 25 days per year + 8 bank holidays (holiday year January – December). We require applicants with a good level of concentration, focused and with a strong work ethic for our busy profiling department. The job entails learning to use our saws safely to cut all sorts of different steel according to customers’ orders. Bundling and marking orders for presentation to the customer. Safe operation of overhead cranes, and flexibility to assist with other operations within the department. Good judgement when planning your day to ensure that all work is processed correctly and on time. Operate our overhead cranes safely. Be able to sling loads correctly and use magnets and straps where appropriate. Understand the principals of manual handling and demonstrate that you can manually handle steel correctly. Learn the different products that we saw and be able to pick those products correctly. Be able to understand the job card system we operate and complete the job card once an order has been cut. Understand and be able to work our steel off cut system. Learn how to operate at all of our saws correctly. Demonstrate that you can work the saw safely. Learn the different saw blades and their applications. Be able to change the saw blades correctly and safely. Learn how to clean the saw. Understand the need to check material before cutting to ensure it is correct, to check the cut size before cutting and check a sample of cuts after cutting. Learn how to package and label different cut sizes and quantities of completed orders. Ensure your work area is clean, tidy and safe at all times. Work closely with colleagues in the warehouse to assist with the day to day shop floor operation. PPE will be supplied and you will be expected to wear it at all times when on the shop floor. Please note these may change to meet the needs of the business. We require applicants with a good level of concentration, focused and with a strong work ethic for our busy production department. To apply for a vacancy please download and complete the application form, the equal opportunities form and send them with your CV and a covering letter to - HR Manager, Abram Pulman & Sons Ltd, Walton Street, Sowerby Bridge, West Yorkshire, HX6 1AN.